Everybot developed the RoboSpin Technology which controls the speed and direction using two dual spin mops without having to utilize wheels. RoboSpin Technology, which was developed after years of study and testing, consists of mechanical engineered technology, dynamics technology, and motor controlled algorithm. With this system, our device can use optimized cleaning modes to clean everything from harmful fine dust to wax residue to stains. 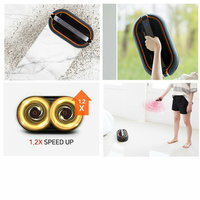 It can control speed and direction of each pad on its own, meaning it can implement and optimize cleaning action automatically. This device knows everything we know about mopping floors and then some! Continuous Wet Mop Cleaning by Auto Water Supply System. Patented water tanks and water supply system can easily clean your floor using the wet mops, thus saving you from the hassle of refilling the water tank every once in a while. Strong Adsorption and cleaning force with patented mop construction. Diving yarn can wipe dirt and polluted particles. Microﬁber can absorb the ﬁne dust and stains effectively. Two different mop constructions can improve the cleaning capability and performance. 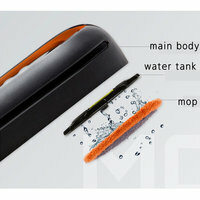 Mop pads can be cleaned in the laundry or you can hand wash them. It will be as good as new. Extremely easy to operate, simply at the touch of a button or a remote controller, this device is wireless, eliminating all the hassle and mess of tangling cables in the house. When met with obstacles such as a wall or furniture while in motion, this sensor can detect it and travel on a different route to minimize contact with its bumpers. When met with a falling area such a stairway, cliff, while cleaning, sensors will be able to avoid it and travel on a different route. If you think the obstacle sensors are all the electronics this little device has, you’re in for a surprise. What if we told you the Everybot knows to move back to a well-lit location after it is done cleaning? Think about it. If you have a dirty floor under a piece of furniture, normally you would have to move that furniture out of the way and then mop the floor yourself. But not any more. 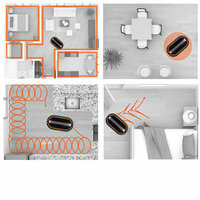 Not only can the Everybot drive right under that furniture and clean the floor until it is spotless, it will drive itself back out from under that piece of furniture when the job is done using its unique ESA (Exit Shadow Area) technology! As a basic cleaning model, cleans the entire space efficiently. Are you in need of super scrupulous result? Then Y curve cleaning mode to get the most out of your Everybot. Special for focused cleaning on areas that need that extra attention. 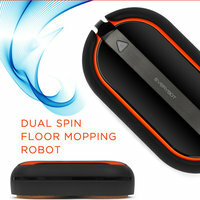 Your smart robot will sweep the floor through carefully rotating by 180 degrees along the walls and corners. Dry mop cleaning mode can adsorb ﬁnd dust tightly. RS700 can clean the ﬂoors by not only wet mop cleaning patterns but also a dry mop cleaning pattern designed by numerous test and know-how. Electrostatics cleaning method can remove pet hair, clothes lint, and tiny dust which is not visible to eyes.